What does this app do? 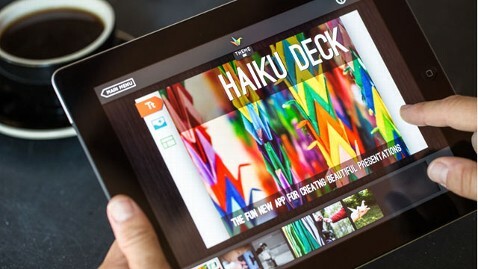 : Haiku Deck provides a set of tools that allow users to design, edit, and share eye-catching presentations. The app, which released an update this past week, has garnered over 250, 000 users since its initial launch this past August, according to Haiku Deck's CEO, Adam Tratt. The idea is to make creating slideshows and rich content a clear-cut process without overwhelming a novice user. "Our goal was to reinvent the process of creating presentations," said Tratt, "To make it simple, beautiful, and fun." Think of the app in terms of its namesake, a Haiku. It works within a simple framework with just enough structure through which you can communicate a complicated idea. Navigating the app proves to be easy. Tap the add button to begin building a series of slides, swipe through a carousel of theme options such as "Cinematic" or "Parisian Nights" to give your presentation a specific look, and select images from the app's library of Creative Commons licensed material by searching a specific tag, such as "friend" or "beach." Users can also import their own images from a variety of locations, such as Facebook, Picasa, Flickr, Google Drive, or the iPad's built-in camera roll. Often, users need to find a way to represent data visually when building a presentation, and Haiku Deck provides three basic options to accomplish this. Select a pie chart, bar graph, or numbered list and label the individual sections. Tap and drag on a delicate gray circle to adjust percentages and adjust the color palette for consistency. Once you've completed a deck of slides, you can share your presentation across the Web and review it on mobile devices. We tested this process, reviewing our own deck of slides on iPhone, Blackberry, and Android devices without any difficulty. Is it easy to Install? : Yes, downloading and setting up Haiku Deck proves a cinch. Should I try it? : Haiku Deck is designed for an everyday user, not the professional presentation designer. To that end, the app accomplishes its goal, letting users create a straightforward deck of slides with a consistent look, making this a useful app for a small team meeting, a story pitch, or a classroom. For the more advanced user who might want more features, Microsoft PowerPoint or Prezi provide deeper, more complex toolsets with more editing flexibility.